One out of every four people living in the United States will die in a nursing home. To say that access to palliative care is lacking for these individuals would be an understatement. What palliative care is delivered is too often limited to those who are eligible for and elected hospice care. A study published in JAGS this week gives us some of the best evidence so far that palliative care can be delivered in this setting, and is associated with less hospitalizations and burdensome transitions. The study authors looked at data from two palliative care provider organizations that were subsidiaries of hospice agencies in order to identify nursing home palliative care consultations in North Carolina and Rhode Island. Between the study years of 2005 to 2010, these two organizations were the only providers of palliative care consultations in the two counties in North Carolina and the six in Rhode Island where study nursing home were located. The data from these patients were then linked to Medicare and MDS data. The authors compared this group to a propensity score matched group to control for factors such as age, gender, race, gender, cancer or dementia diagnosis, functional and cognitive impairment, recent hospitalizations, nursing home characteristics, and DNR orders. The authors ended up comparing 477 nursing home residents who died between 2006 to 2010 with initial palliative care consultations within 180 days of death against 1,174 propensity score–matched controls that did not receive these consultations from the same nursing homes. Furthermore, earlier admission to consultation programs was associated with lower hospitalization rates in the last 7 days of life. Lastly, the adjusted Medicare expenditures in the last 7 days of life were significantly lower for residents with initial consultations in the last 30 and 61 to 180 days of life than for controls. In a closely related article in JPSM, the same authors found that nursing homes introducing specialty palliative care consults experienced greater overall reductions in end-of-life hospitalization rates compared to nursing homes not introducing consults. Also, in another JAGS article, for every three nursing home residents that participated in an advance care planning intervention using specially trained nurses, two changed their documented treatment preferences. Taking all of this data as a whole, it’s encouraging to see that palliative care can actually work in community nursing homes. I have to wonder though, how many of our palliative care trainees get any meaningful experiences in nursing homes in order to prepare them to give these types of consultations? We have such a model where nurse practitioners who are trained in palliative care are based in skilled nursing facilities. This provides on-site close relationships between the NP and the patient/family, staff, and attending physicians. Advanced Care Planning is expected, and symptoms management is ongoing. Transition to hospice occurs in real time. The common barriers are family, who often have unrealistic expectations, and the only way to influence them is through the process of developing a trust relationship over time. It is kind, caring, cost avoiding care. This population lives in the shadows for most of our society-present GeriPal audience, notwithstanding. This validating article once again reminds me of how desparately mismatched resources and expertise are to the incredible unmet need for the modest skills and compasssion-in-action that high quality palliative care interventions bring. We need development of more network capacity for palliative care services to be deployed nimbly to people with serious illness in nursing homes, specialty clinic, hospitals, and homes. The only thing that can drive the creation of that human infrastructure for caring will be favorable economics. The savings that come by investing in in the care of our fellow human beings approaching the completion of their life cannot be added to the profits of venture capitalists. Rather, they need to be reinvested in the creation of greater capacity for this valuable kindness. Thank you, Eric. Very nice post as always. 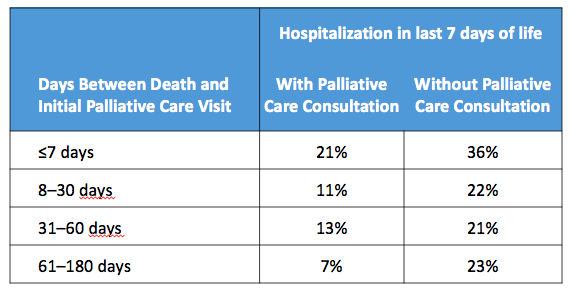 How often do you palliative care consults in within your own VA nursing home? I have found even where there is robust palliative care service, they often don't do many consults for veterans living within the VA Centers for Community Living. Great question Anonymous about the VA nursing home. One thing that the VA has led the way on is making sure that every medical center has a palliative care service. We do and we provide consults to our VA nursing home. We can definitely do more work there and there is need. With that said, we are also realizing that the palliative care needs of Veterans living in community nursing homes are so very great. It's something that we are trying to figure out how to deliver, so if anyone has any suggestions would love to hear them. That's one of the reasons I loved this article as it is a guidepost. This article is amazing and hits home. We need education in our communities and public to make aware of the quality of life that hospice and palliative care can give. People have misconceptions concerning hospice and our VA elderly and skill nursing facilities need more palliative care. The need is so great but the knowledge needs to be introduced along with ways to make this happen. I would love to be involved in making this available to our VA seniors. There is a familiar pitfall here--calling one nurse or NP a palliative care "program" is inaccurate and misleading as to the transdisciplinary nature of palliative care. A recent article on "palliative care" consults by a single team member in the ICU setting found this to actually cause harm to surrogates. We need to continue advocacy for all that palliative care is about--the whole team. Perhaps the authors addressed in the original article.